We all have different talents, hobbies and passions. What we all have in common, though, is that we can use these individual interests for a greater good - we just have to want to! There is already an ever-expanding group of people who support us by doing the things they love, and using those things to raise awareness and money for the street kid projects we operate. Part of the draw is that unlike many charities we can promise that 100% of what you raise will go directly to our projects in Ethiopia - there are no “black holes”. Of course we are always delighted to assist you before, during or after your fundraising adventure in whatever way we can. Whether it’s online fundraising, personalised sponsor sheets or promotional literature, we can help - we even provide you with branded T-shirts! PHOTOGRAPHY: Martin Spence and Luke Holmes both love landscape photography and enjoy getting out into nature all over Northern Ireland and beyond. So, using their passions and talents, each year they help us produce our “Inspiring Ireland” calendar that we are able to sell to raise funds. 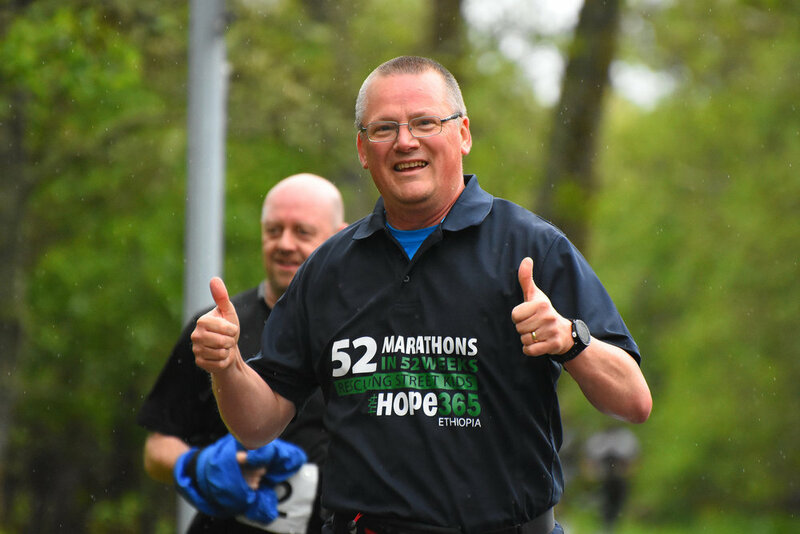 RUNNING: David Norwood has just completed the most amazing fundraising activity to date - running 52 marathons in a year! He only started running a few years ago as he says “to lose a bit of weight” but he just kept on going, and now he has raised over £10,000. WALKING: Caroline Bickerstaff was so struck by the needs of the street kids when she heard of their plight at a seniors club that she organised and participated in a six mile sponsored walk. CRAFTS: Dorothy who loves to knit kindly started to donate the most beautiful hand knitted craft items which we bring along to craft fairs to raise funds. CYCLING: If cycling is your thing then perhaps your club could choose us as their charity of the year - as both Kilbride Cyclists and Kings Moss have recently done - or perhaps like Stephen Hunter you fancy lapping the lough - FIVE TIMES! MUSIC: Local musician Wes Grierson uses his gifts each year by pulling together a great band and putting on “The Big Gig at Christmas” which is becoming a regular part of the build up to Christmas. COFFEE: If you just enjoy a cup of coffee and a chat, we can also provide you with a Coffee Morning pack. These include recipe cards, invitations, promo posters etc - everything you need to host a coffee morning in your home or workplace. So no matter what you love, you can make a real difference. If you would like to propose a fundraising idea or just want to chat through a possible plan, please don't hesitate to get in touch!